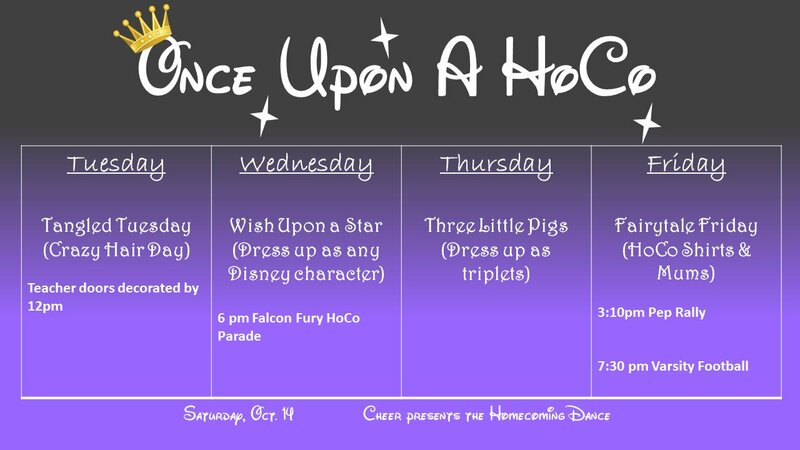 This year’s homecoming theme is “Once Upon a Homecoming.” The theme was decided on last year on Twitter posted by Student Council. Hats will be allowed for dress up days as long as they are appropriate for school. As a challenge to give back to the community during homecoming week, there will be a competition among the different grade levels to see who can collect the most canned goods. More information regarding the rules of the competition can be found here. 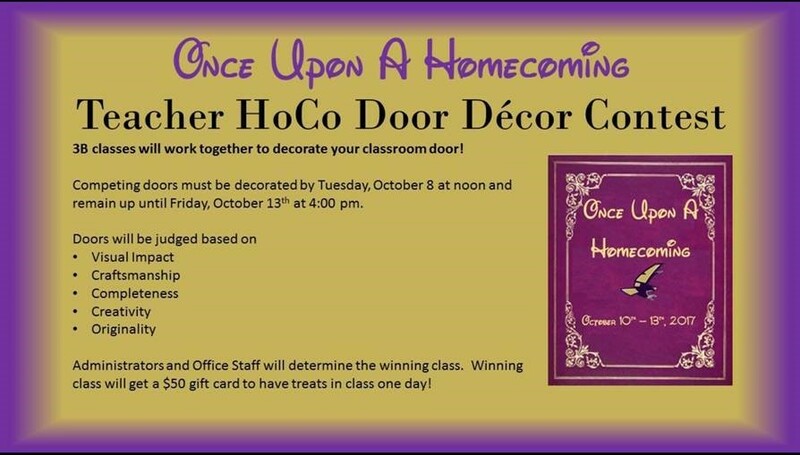 Also, during 3B classes there will be a door decorating contest. The criteria for the door decorating contest can be found here. The winning class will win a 50 dollar gift card for treats to be celebrated during class time up to teacher discretion. The homecoming parade will be held on Oct. 11 starting at 6 p.m. The following information applies to all members involved directly or indirectly with the Falcon Fury Feeder Pattern and the presentation of it’s homecoming parade for the 2017-2018 school year. *Groups will not be permitted to line up prior to 5:15. This year’s homecoming theme will be “Once Upon A Homecoming”. We are striving to have all those involved embrace healthy competition along with good sportsmanship. Floats should include any fairy tale or story book . 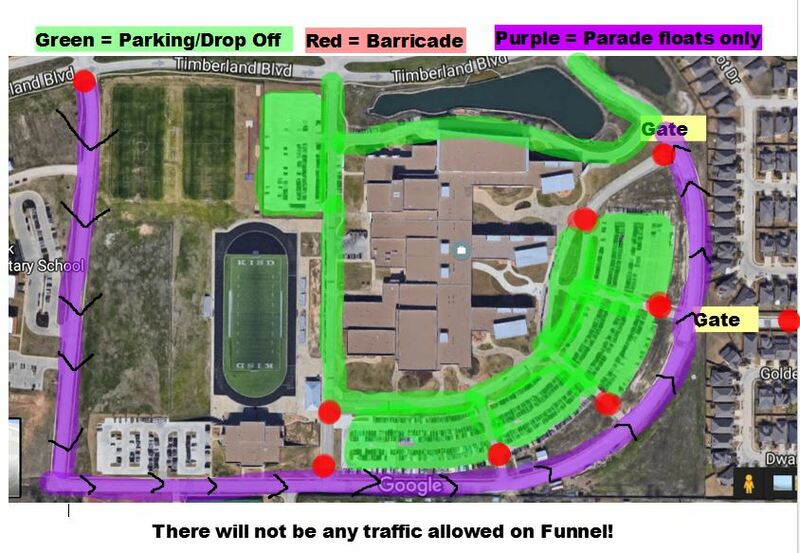 There will be a U-TURN being made on Timberland Blvd., so please make sure all floats are able to make this turn before the day of the parade. No items may be thrown to the crowd. You may hand candy to spectators, but throwing is dangerous and is prohibited. All school organizations wishing to walk, perform, or participate in any fashion must fill out the Google Form on the registration page to ensure a place in the assigned line-up list. Please include numbers of people as well as a small description of your organization or groups performance or intentions. Personal vehicles may be used in the parade. Students will not be allowed to drive in the parade. All vehicles must be driven by parents, grandparents, other adult family members and KISD staff members. Our goal is to keep all parade participants and spectators safe. If you are handing out candy or other items, please have a few students walk along the curb to pass them out. Spectators will need to stay in the grass this year. Comments: Please send any concerns to stacey.cleveland@kellerisd.net. The homecoming parade will have live-streaming coverage with a unique perspective. Link and other details to be included closer to the date. The homecoming game will be at Keller ISD Stadium on Oct. 13 versus Weatherford at 7:30 p.m.
Tickets will also be sold on campus in the School Store (Birdhouse/Creek and Co) location on both Thursday (Oct. 12) and Friday (Oct. 13) of Homecoming week. Timber Creek Sports Network will be producing video coverage of the game that will be available later that night. TCFM will have live radio coverage of the game, including a live announcement of the Homecoming crowning of King and Queen. The 2017 homecoming dance is on Saturday, Oct. 14, 2017. Ticket sales will start on Monday, Oct. 2 through Friday, Oct. 13 for $20 each. UPDATE Oct. 9, 2017: Homecoming Dance tickets are officially sold out. Please note, this year attendance is limited to 1,200 students, so plan on purchasing your tickets early. The attendance limit is due to fire codes, according to TCHS Administrators. Anybody wishing to enter the dance must have their ticket and a photo ID present at the door. Student ID’s, driver licenses, etc. are acceptable forms of photo IDs. Guests that do not attend Timber Creek will need to fill out a guest form and present it when they purchase a ticket. Guests that wish to attend must be 20 years of age or younger. Get the form for non-TCHS guests by clicking here. The dress attire for the dance will be semi-formal. There is no set dress code for the dance as long as it is not too fitting or revealing. The girls will be allowed to wear strapless dresses or one sleeved dresses. The guys may wear dressy casual and jackets will not be required. During the dance, there will be a DJ, photo booth, desert table and water stations. Students will not have to pay extra for these items as they are included in the dance ticket. Security for the dance will be provided by Fort Worth PD. Nominations were held for Homecoming Court during the last week of September. Over 880 students submitted nominations to Talon’s forms. Ballots for voting will be available on Talon, Thursday, Oct. 5 and Friday, Oct. 6 during lunches. Homecoming King and Queen will be announced at halftime of the Homecoming football game on Oct. 13. This page will continue to be updated as Homecoming gets closer. Link for homecoming dance tickets isn’t working???? This link doesn’t work either. We found the error and have re-embedded the link. Please try again. Is ther homecomings guest forms online that can be printed out? What time will the homecoming dance end? What do you do if you got your tickets online? what time does the dance start?? ?